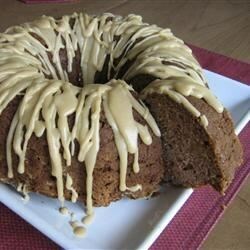 "This is a very moist Bundt cake that lets you use up those apples that might be going soft. My family loves this. It is a Fall tradition at our home." Excellent flavor, super moist. Easy recipe. This cake is simple and very good. I cut the sugar in half and chopped the apples instead of grating them - received lots of compliments on the cake. Very moist and tasty. I reduced the sugars by .25 cups each and increased the cinnamon by .5 tsp.